Cali was the joy in my life. My son brought her home when she was a pup. I said no more dogs. We had 2 collies. Well I watched her one day and fell in love with her. She was so smart I couldn't believe it--smarter than my collies. She was 9 when she passed at home. She wouldn't let my wife sleep on her side of the bed. Cali laid there and wouldn't move. My wife took Diego a red nose pit Cali's brother and the other dog in the other room. Cali slept on my pillow. Later that night she got up and fell in the hall. We carried her outside. She fell. We carried her back to bedroom and she was gone. My heart stopped. My baby girl was gone. I am SO SORRY in the loss of your beloved Cali. I cannot stand the thought of losing my boy Peanut. He will be 5 in March and he IS the love of may life. He is a red nose (like Cali) brintle fawn pit and if ONLY everyone knew what a loving, loyal , dedicated breed this is. I'm so sorry for you loss. I'm crying as I'm reading this. Because I know how smart these dogs and lovable they can be. My dog Zeus died over 3 years ago not by choice but because a dumb stupid man hated pitbulls and ended killing my boy Zeus. When the Vet told me he had passed away I literally broke down and wanted to die with him as well. I knew I couldn't because I had my other 2 pits to take care of. It took me a long while to finally accept it and get over it with the help of my dogs. I know with out them I would have not done it. Not even my Husband could have done what they did for me. I now have a new male in the house he is a white deaf boxer that is the joy at our house. My female pits just adore him. It's so unbelievable of how much these dogs love their humans. Just by reading your story in makes me sad to even think what would I do without my dogs. I don't see my life without them because they are the sweetest dogs ever and I love them to the moon and back. Just want to say thank you for loving this breed after being so judged by the media. If they only knew all these dogs ever want is to be loved and cared for from their humans. It will take time for your heart to heal but just know that Calli is in a better place and will always be watching over you. Thank you all for your thoughtful reponses. Cali did so many things one was when we came home or people came over she had to find her toy or bone and greet with a growl every time she did this. We did get another pit puppy Gotti he does similar things Cali did as a puppy this is kind of strange. CALI had a bench in front of our bed where she would lay under when gotti first came home he went under the bench and layed there. I am very thankful for all your prayers and thoughts thank you all so much. I am so sorry for your loss. I know the kind of heart ache you are feeling. I love the pitbull breed they bring so much joy and silliness. 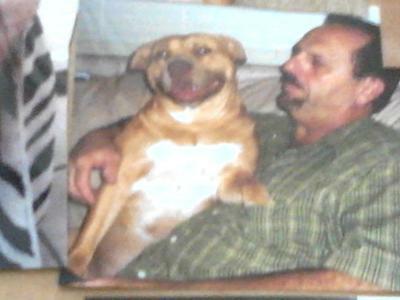 I rescued my first pitbull 20 years ago from an abusive situation ,his name was moufasa,and he lived to be 17 years olg!My two boys knew this dog ther whole lives,and it was very tough on us when he died,3 years ago,we still miss him greatly .I had a female named coco,who was rescued also,but she died about 6 years ago at only 10 years old.Thankfully they had 1 litter of pups together,and we kept 2 brother s ,Cowboy and Monster.Unfortunatly Cowboy died last oct.and we were heartbroken again.even though he was 14 ,it was still very sudden .The 1 brother we had left is still alive ,but alas,I know his days are numbered ,he has a nerve issue in his back legs cause ing some paralyse ,but I am buiding a wheelchair for him.I have been in treatment for PTSD for 3 years now ,part of my daily routine was walking a dog for an hour or 2 every day,so when Cowboy died I was very depressed to lose that.Luckily a friend that I've know n since childhood brought me a little female about a month later,and she is the new love of my life!Her name is Ms. Reington Steele,and I have sp much love for her,think cuz I see little bits of my other dogs in her,when at one time I swore i would never love a dog like that again,I now realise it is the besr way to honor the r memory ,and ther are so many good pitbulls that just want love .The best way to mend a broken heart is a new love,and they have so much love to give..